In a surprise to absolutely no one (I hope), all of the brands, clothing stylists, and hair sorcerers at Texture on the Runway were all mega stars. Pekela Riley of Salon PK is one such mega star who shaped the looks coming down the runway for Creme of Nature. She's sharp, skilled, and a hell of a smart dresser, and it was as exciting as it was intimidating to get to sit with her and chat for a bit. You call yourself...well, you ARE a "Hair artist" rather than a "hair stylist" What differentiates the two? Does she not give you life from the get go? I've seen some really great fades on your feed! Is that something that you started earlier or later in your career? It's actually something I knew how to do before I went to hair school. My mother was a barber so I knew how to cut hair early on. For many years, my focus was on traditional styling and, now, with the celebration of natural hair and focus on shape I get to do more with it. Follow up on that, do you see your work with clippers as a sort of breaking into the more male-dominated side of black hair care? Yes, absolutely! I'm making a statement for the ladies that we can get down with the guys and we can hold our own with the clippers. You're working with Creme of Nature, and they're running on the ethos of 'SuperNatural' What's your personal superpower? I make others fly…I can teach others how to fly or give them the power to fly. I feel like when I style someone and they love the color, cut or look created and it boosts their confidence they are flying and soaring on a new level. Humor my geek side for a second, but if you or your hair had a comic book style superpower, what would it be? My hair looks kind of like an Anime character – it's undercut in the color of denim in a jagged kind of bob. If I was a comic book character with superpowers, I would throw out a web of style skills where you can get so many things from cuts to color to twist-outs to braids. Once you had an idea of the theme, did all of the styles you walked just pop into your head, or did it take a minute? Once I had the spark of inspiration it all sort of came to me. I wanted to celebrate the diversity of each model and each texture and connect them through details. 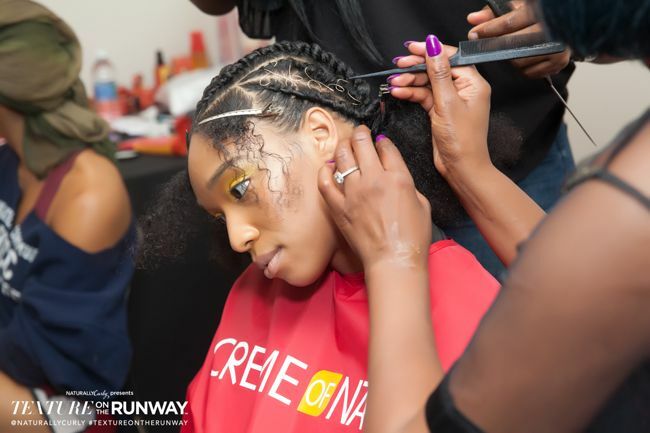 They will be individuals connected through the beauty of textured hair. Art mirrors life. We all have common threads even though we are individuals. I've always been the kind of person whose hairstyle determines her outfit, or vice versa. Did you collaborate with David De la Cruz at all with the looks, or did everything come together (super)naturally? It was a coordinated effort. I think that art and hair marry and I wanted to make sure that this was a good marriage so we coordinated, cooperated, and created art cohesion. We are married in this collection! He's like my work husband. Isn't that the sweetest thing? When it comes to discovering and working with the versatility of afro-textured hair all along the spectrum of looks and feels, has it been harder to learn or harder to teach? If so why, and if not what do you attribute the ease to most? I think it's harder to teach. I grew up seeing hair - my mother was a barber and the women in my family were always braiding. It came naturally so now, I find that it's harder to teach. I attribute that also to us seeing versatility with texture, we still have of work left to do on a personal level of acceptance of your texture. Unfortunately there's still the perception of an ideal curl and now we have to move away from an ideal curl. The 4C girls want to know if a product will make it a 3. We need to embrace our curls! The product won't change your curls but it will define and shine your curls making them look gorgeous. Unfortunately there's still the perception of an ideal curl and now we have to move away from an ideal curl. Would you say it's more important to be realistic or more important to shoot for the stars with your looks? Does your answer change for non-stylists doing their own hair? I think it's more important for non-stylists to be realistic with their hair. I believe satisfaction equals happiness and satisfaction is based on expectation. I want you to be proud of yourself when caring for your hair at home and not feel totally catastrophic in a way that makes you never attempt to do your hair again. When you want to take a chance, see your stylist for that. Tell us about a time you confronted the 'impossible' with hairstyling. I went into labor with my youngest son while styling hair. I thought my stomach started hurting because my navel was close to the back of chair but, no, I was about to give birth. I finished the hair because I thought the pain would go away (he was a little early so I wasn't expecting to deliver that day) but this was a different type of pain. I finished the hair despite the pain. It came out as a beautiful bob. Being here at Texture on the Runway. I think that what fuels the artist in me is that I don't have that moment, and I always feel like there's always the next thing, so I'm constantly in pursuit of the I made it moment, the next thing. It keeps me hungry! Okay, so our readers are gonna want to know what are your go-to products...your house is burning down, what hair products do you shove into your bag? Perfect Edges Black is definitely going in the bag, because I have gray hair, and it lays my hair down and it covers my grays. Okay! So making others beautiful is your profession, you're on your feet all day, what do you do for YOU? I will run away and I will take a spa day, and I will like blow a bag at the spa. Just let myself feel how I imagine my clients feel. Then I go back to the grind! So I have yet to have a spa day or a massage or anything like that...what's your favorite procedure to get done? I love body scrub, I think it's something that people don't really think that they need until you get one. You feel like a brand new baby. It's how I renew myself. This is why I work hard, it's one of the few things that makes me feel like the grind and the reward match up. Lastly, which Creme of Nature products have you used in the looks you walked? Thanks so much for your involvement and for speaking with us! Was that not mind blowing? I dare you to tell me that didn't rock your world. For more from Pekela, feel free to jump on her Instagram, and DEFINITELY jump on @cremeofnature for extra inspiration. For more TOTR coverage stay tuned to all @naturallycurly channels, and start making arrangements for next year! You could say we're looking to keep growing things out, so be sure you're keeping up! This post is sponsored by Creme of Nature.